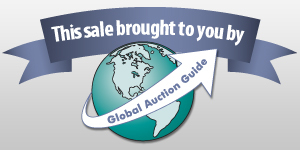 Global Terms:Larry Otten dba Larry Otten Auctioneers, herein referred to as Auctioneer is conducting auctions on behalf of the property's seller. By placing a bid on auctioneers online selling site or in person, the buyer is agreeing to all terms and conditions stated hence forth or posted onsite. Auctioneer reserves it's right to revise terms and conditions at any time.TERMS OF SALE:* Everything will be sold "as-is, where is". * Buyer shall rely entirely on their own inspection and information. * The bidder is responsible for knowing which item he/she is bidding on. If unsure, inquire or do not bid. * Once a bidder places the winning bid and auctioneer says sold, that bidder is soley responsible for proper payment of lot(s) won, and keeping track of the lot. Auctioneer not responsible for any lot disapearances. * Occasionally a lot will have to meet a minimum reserved price in order to sell. * The winning bidder has effected a contract and is expected to pay for items according to winning bid placed, regardless or any unexpected computer or clerical error after that point. * Any online credit card payment declined or onsite payment not made when due, auctioneer may at its discretion resell to another bidder at any time. Payments must be made when due. * The Auctioneer reserves right to refuse a bid card and/or reject bids not in best interest of the seller. * Absentee bids accepted day of sale in person or by phone, a valid VISA/MC/DSVR/AMX must be given to be honored. * Purchases must be paid on day of sale, auctioneers or owners make no warranties or guarantees as to genuineness, authenticity of, or defect in any lot and will not be held responsible for advertising discrepancies or inaccuracies. All sales are final, when awarded to the successful bidder. Buyer accepts full responsibility for all purchases made and holds the Auctioneer, owners, and property owners free of any liability in the event of theft or disappearance of any items purchased or consigned. Auctioneers is not responsible for any liability or damages occurred or associated with during or after the auction. * All Children under the age of 18, must be accompanied by a parent or guardian and supervised at all times. * Smoking is not allowed in auction yard.BUYER REGISTRATION:* There is no charge to register. * You must register for each auction to receive bidder number. * Online registration require a valid debit / credit card for a payment method. * Buyers names are to remain confidential. * Auction company reserves the right to require a cash deposit if it believes it is in their best interest.ONSITE PAYMENTS: * All payments are in US funds and due by 5pm. * 3% per day on the outstanding balance late payment fee. * Local Texas Sales Tax : 8.25% - Sales tax applied to invoice total and Buyer's Premium, including Internet Premium. * Buyer agrees to pay all applicable sales tax on all purchases, unless the buyer provides proof of exemption that is issued by the appropriate Local or State Government Agency. Buyers must meet exemption requirements of the state or local Government Agency at the location in which the auction is held. Buyer also agrees to pay any sales tax that may be assessed after any payment has been received. * Payment Options: Visa, MasterCard, Discover, American Express, ECheck, Wire Transfer, and Cash. * There is a $15.00 wire transfer fee. * Credit Cards accepted with a 3% convenience fee when the card is swiped in person, with all sales final and no sale shall be invalidated. No refunds and credit card payments cannot be reversed. * Please allow up to 15 minutes after an item has sold in live auction, to pay for it.ONLINE PAYMENTS: * All payments are in US funds and due by 5pm. * 3% per day on the outstanding balance late payment fee. * Local Texas Sales Tax : 8.25% - Sales tax applied to invoice total and Buyer's Premium, including Internet Premium. * Buyer agrees to pay all applicable sales tax on all purchases, unless the buyer provides proof of exemption that is issued by the appropriate Local or State Government Agency. Buyers must meet exemption requirements of the state or local Government Agency at the location in which the auction is held. Buyer also agrees to pay any sales tax that may be assessed after any payment has been received. * Payment Options: Visa, MasterCard, Discover, American Express, ECheck, Wire Transfer, and Cash. * There is a $15.00 wire transfer fee. * Online Credit Cards accepted with a 4% convenience closing fee with all sales final and no sale shall be invalidated. No refunds and credit card payments cannot be reversed. * The credit card used for the method of payment on your HiBid account when registering for this auction will be charged at conclusion of auction.ONSITE BUYER'S PREMIUM:* A Buyer's fee will be charged on all lots sold.10% on the first $5,000 and 5% on the remainder.ONLINE BIDDING BUYER'S PREMIUM: * A Buyer's fee will be charged on all lots sold.10% on the first $5,000 and 5% on the remainder (+ the 4% credit card convenience fee ).In the event of a tie bid, floor bidders always take precedence. Auctioneer accepts no liability for any failure or delay in executing bids or any errors contained in bids via the online bidding service.REMOVAL:* Buyer must present a PAID invoice before items can be removed. A $10 fee per invoice number will need to be paid by a buyer before a copy will be printed or emailed. Buyer is responsible for keeping track of their paid invoice. * Items must be removed by 5:00pm following Wednesday. * Larger Equipment must be removed by 12noon following Friday. * NO items allowed to leave Auction site until paid in full. * NO items allowed to leave Auction site until Auction concludes or permission has been given. * Buyer is responsible for contacting auction representatives and making arrangements to pickup their items won within the time allowed. * Items not picked up within time specified, a $5.00/day storage fee will be charged after 14 days unless other arrangements are made. After 30 days, items not picked up will be resold on with the seller's fees and commission deducted from the selling price and the remaining money forwarded to the original buyer. Auction Lot Hours/Schedule for Item Removal:Auction Day Saturday - till 5pm (MST)Sunday......................- ClosedMonday.....................- 9am - 5pmTuesday....................- 9am - 5pmWednesday..............- 9am - 5pmThursday..................- 9am - 5pmFriday........................- 9am - 12noon*** Gate has contact phone infoOUR LOADING / UNLOADING POLICY:* Auctioneer is not responsible for loading or unloading equipment or the securing of any loads. * Auctioneer is not responsible for verifying that equipment being transported to/from the auction yard is properly secured or being carried in compliance with applicable transportation laws and regulations. * Auctioneer will not load and/or unload self-propelled equipment under any circumstances. * At its own discretion, Auctioneer. may (under the direction of the driver) help load and/or unload stationary equipment from a truck, trailer or container, when a loader or forklift is required. * Loading and unloading of equipment is only permitted during daylight hours. * Access to and from the auction yard is only permitted through the designated truck entrance. * Auctioneer will not provide delivery receipts; however, if confirmation of delivery is required, Auctioneer can sign a bill of lading to confirm receipt only.SHIPPING:* We can arrange to ship small items via USPS or UPS to addresses in the USA ( lower 48 states only), please tell us your preference or we will choose the least expensive for you. * We can arrange to ship larger items via LTL Frieght to addresses in the USA ( lower 48 states only), please tell us your preference or we will choose the least expensive for you. We will need to know if it is residential or commercial address and if a loading dock or forklift is available to unload. * The shipping charges will be added to invoice due, or will be billed seperately afterwards. * If items need to be packaged for shipping; buyer and seller will negotiate seller's compensation. * There is a $4.95 administrative fee per lot to ship via USPS/UPS. * There is a $25 administrative fee per address to arrange for shipping via all other freight. * There is a $4.95 fee per pallet when needed to ship. * Pickup is Free.RISK OF INJURY: Bidder acknowledges that an auction site is a potentially dangerous place and shall be deemed to be there at his/her own risk. No person shall have any claim against the Auctioneer, owners, their agents, employees or principals for any injuries sustained or for damages to or loss of property which may occur from any cause what so ever. Bringing children is not advised and must be monitored by an adult. Announcement:Information contained herein is presented on behalf of the seller. Larry Otten Auctioneers, agent for the seller, cannot guarantee the information to be correct or assume the liabilities for errors and omissions. All lines drawn on maps are approximate. Buyers should verify the information to their own satisfaction. Any announcements made from the auction block on day of auction will take precedence over any matter of print and will be final.